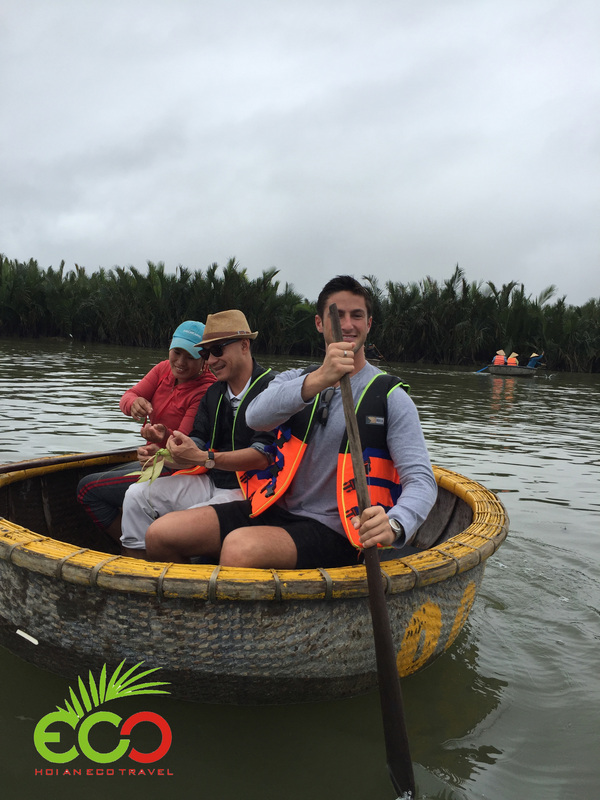 You will be absorbed this feeling on the way to visit the Bay Mau Coconut Palm Forest at Cam Thanh, Hoi An. the landscape in front of you is a peaceful village, only rice fields, simple houses, some animals familiar with farmers such as buffaloes and cows. You will be very surprising when seeing 2 sides of the road is the local houses lying next to the road and children are naturally carefree play near the street. It is a beautiful rural landscape that you cannot find in your homeland. It iscalled (Thung Chai) by local people, a special round basket bowl made by bamboo material, used by fishermen for daily living. This is a very unique basket bowl for you to be curious to experience. It’s not only funny but also strange; I guarantee you have never tried it before. 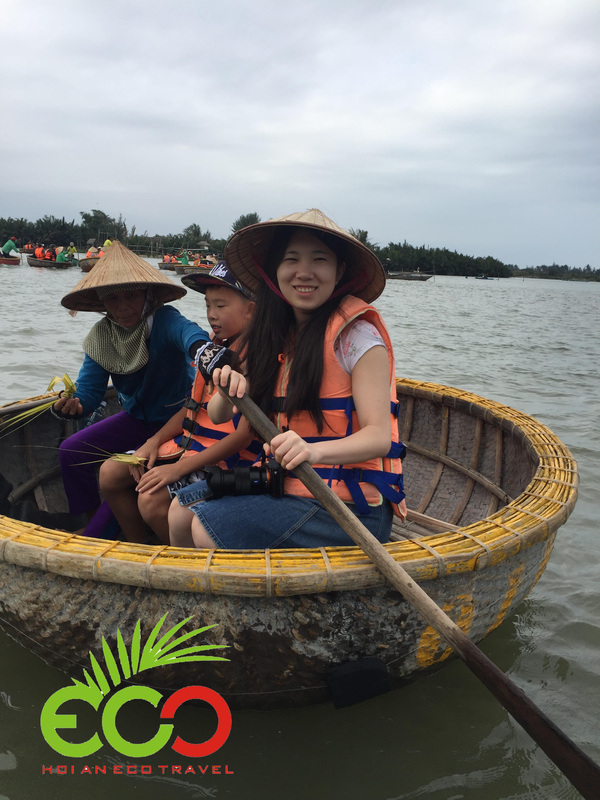 It is not like a boat to use the engine to control, and you always balance when you jump into the boat, but this basket bowl is completely different, it always wobbling, shaking every time you jump into. 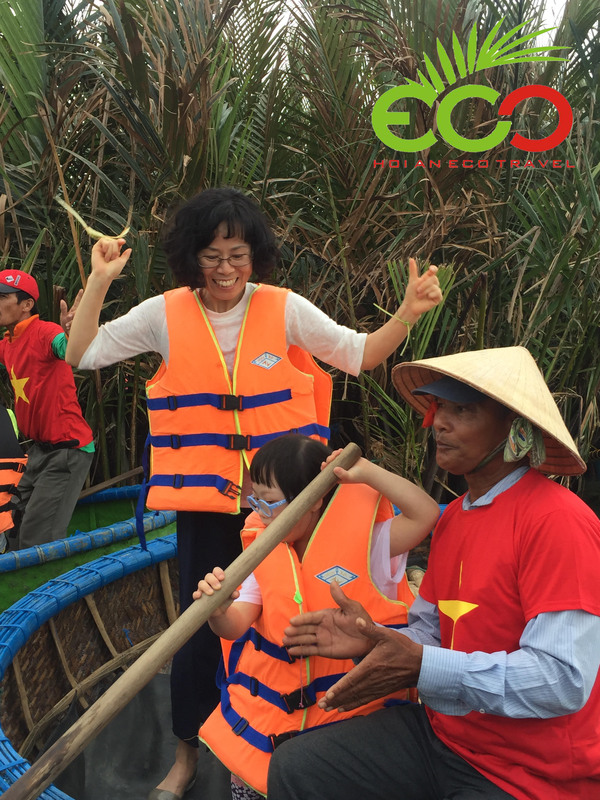 It is very important to balance on the baskets bowl, the special thing is that you want to move, you have to use another necessary thing, and it is a paddle to control the basket bowl follows any direction you want. Try it once time in your life before you feel regret about it. This place has been a revolution base of Vietnam in the past. It has been a safety hidden place for the Viet Cong during the past 20 year in fighting against the French and American army. Today, it is an ideal hidden place for tourist to visit in the summer as well as winter. In the summer, It is fantastic to say that how cool, fresh and comfortable weather it is! The cool, breeze mixed with the blue water of coconut leaves make this place become more peaceful, just only hear the bird, frogs’ sound and others. 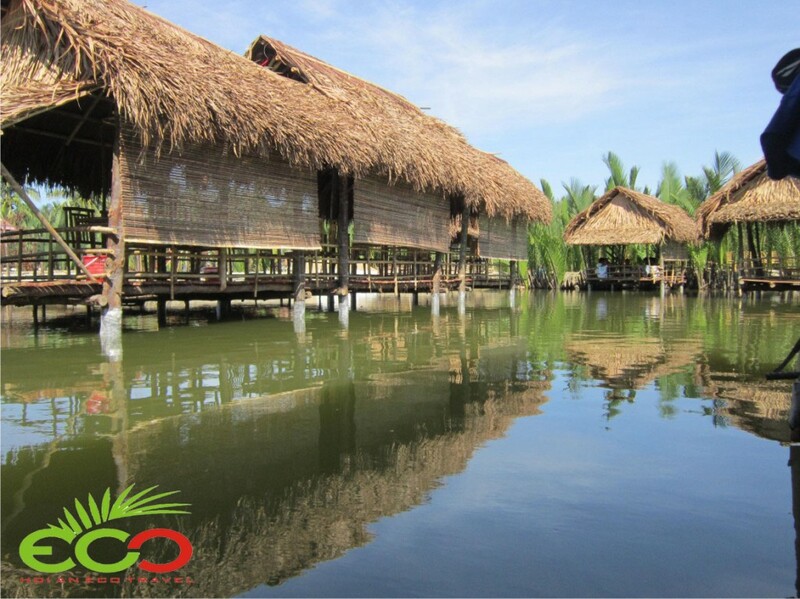 You will hear the sound of water each times paddle falling into the water in moving inside the Bay Mau Coconut palm forest. You will see the coconut fruit, it make into a punch like a punch of flower with a round shape, very nice. 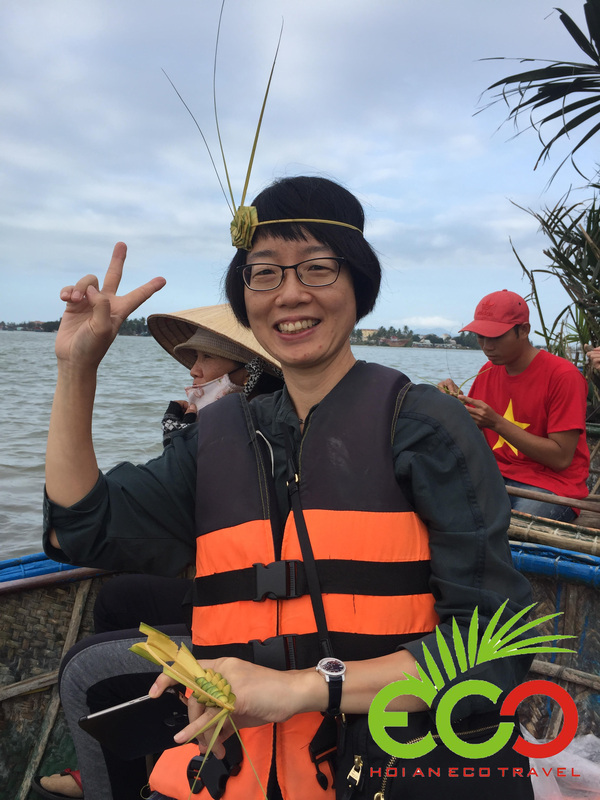 The local people will present for you many valuable gifts make from coconut palm leaves such as diamond rings, necklace, hat, fish, grasshopper, etc. These gifts are although very simple but coherence with their life. Have you ever tried it? Now you will learn how to row the basket bowl, how interesting it is! 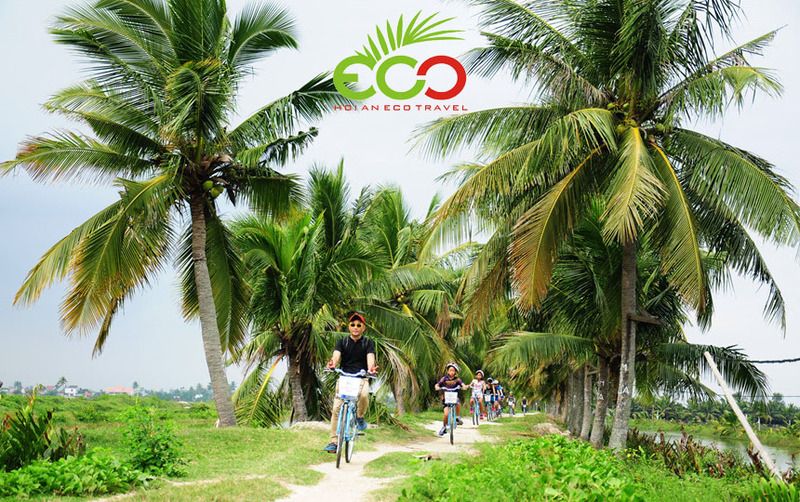 You will stand on a basket bowl, then slowly shake the basket bowl and rotate in an immense of coconut palm forest. It is important that you have to control, balance and confidence in yourself. Keep your legs straight, and put the hold body to ensure the hold weight concentrate on your feet. By doing this, you will be able to easily control the barrel of the basket bowl, it like a tumbler never fall down. Let’s try it! After learning two skills of basket bowl, one is keeping balance and rowing basket bowl, the next skill is racing the basket bowl. You will have two ways; one is use a paddle to control the basket bowl and the other is use both hands to control the basket bowl and shake as strong as you can to the straight forward. This skill may be difficult but very fun. This is a very simple job of the local people here to catch fish for earn living every day. Thus, it is a part of their life, do you want to try? 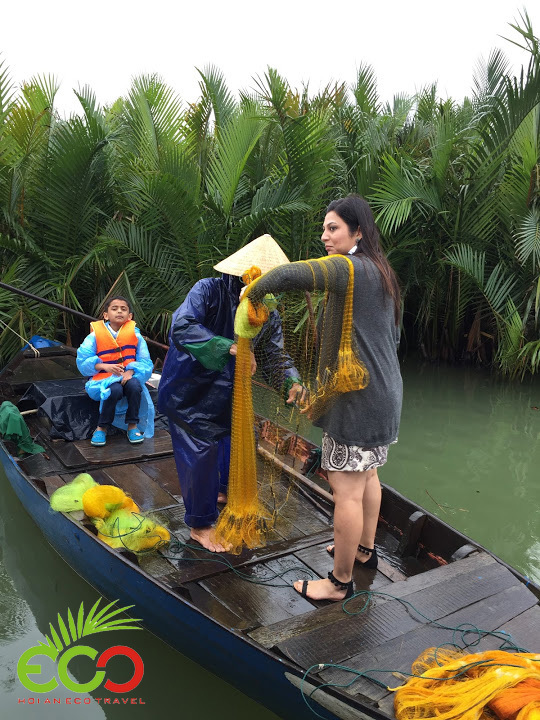 The fishermen will model once time for you to see, then guide you how to knit your fingers into the net to throw it as far as possible to catch fish. Do not forget to capture this moment in your journey; it will be really nice and beautiful images of yours. 7. Dancing and singing together on a basket bowl. I guarantee you never did it before. Normally, people just stand and sing on the safe surface, in contrast in here, you are standing in a very unique space, standing on a basket bowl which always shaking and located on a river, not on the ground. How do you feel, scare? No! It is very interesting? You seem forget who you are, do not care where it is, no matter where you are standing on a small basket bowl, you are seem to be yourself, just want to sing and dance and forget the trouble world outside without thinking anymore. 8. Fishing fish and crab. There are variety species of fish, shrimps, and crabs. It will be an interesting to whom like fishing fish and crabs. Fish and crabs here are not big but you will be very happy to see the little crabs fleeing in and out the coconut Palm, making us very curious to catch them. 9. Enjoy the delicious and fresh seafood dishes. Fried shrimp with salt dishes is very sweet and delicious. Moreover, the steamed clam soup with green chili and lemongrass is also special with its fragrant when eating it. Other dishes such as grilled scallop with fried bean onions, Grilled Chicken Spices, Steamed Squid, and Vegetable Soup are so wonderful. 10. Experience the bamboo tent with the coconut palm roof. After having lunch, you will be rest on the hammocks hung on each huts and enjoy the cool weather, freeze wind from the lake. It is a pity if you skip it.